This post is a week late, seeing as how my short story was released in ebook format last Tuesday. Nevertheless, I am excited and still thrilled by being able to see this story in particular sitting on bookshelves and available for individual purchase. When Heather Webb tapped me for this anthology, my brain immediately raced towards possible plots. I wrote and tossed out a number of ideas–especially since I was learning, painfully, how to write short–until I realized what I wanted to do: honor my unknown ancestors who served in WWI. It’s a long story, but I know little of my family history beyond my paternal grandmother and maternal grandmother. My mom’s dad died before I could meet him with any kind of awareness (I was around him as a baby), and I met my dad’s (estranged) father as he was dying of kidney disease. So history and historical fiction for me is an attempt to find a background of some sort, to imagine what these nameless, faceless relatives might have experienced over the course of the twentieth century. As a result, when I sat down to write my contribution to Fall of Poppies, I didn’t want to write about upper crust Brits, but about people who might have been in my family or connected to them. It was still difficult to write, haha. But I was never more satisfied with a piece of writing than when I sent off After You’ve Gone to my editor at HarperCollins. I hope all who’ve purchased it or the full length anthology will read it with enjoyment. Stay tuned for an annotated post where I explain the historical details in the story. A week ago I received the first pass pages for my contribution to the Fall of Poppies anthology. Until I realized I had no clue what I was supposed to be doing with this document. The editing process, I get. I think I aced the copy-edits. But First Pass…what is this foreign language thou dost speak? The process of What Happens Next (after the snagging an agent, selling a book, yadda yadda yadda) can be so hush-hush, and the rise of self-publishing has created a downturn in author blogging about traditional publishing processes has increased the difficulty in discovering just what heck I’m supposed to be doing. But I like to think that a post from 2009 or 2011 is just as relevant in 2015, so on we march Googlefu. Got it! But what I am supposed to do with them? So that means I can do some light clean-up of the text, right? Phew! So that sentence I cringed over while looking at this file isn’t set in stone. Hallelujah! There you have it–a semi crash course in unfamiliar publishing terms and its process. Back to work I go! 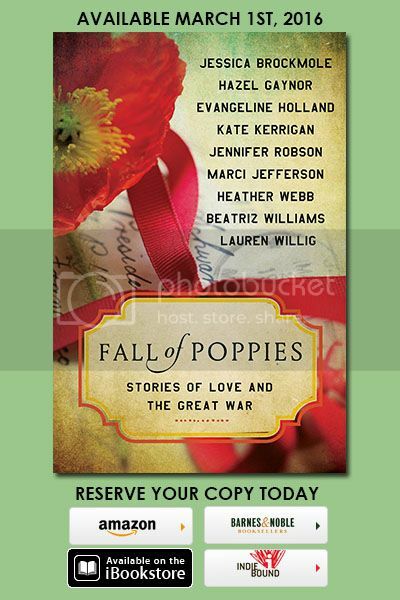 At long last, I am able to share the cover for Fall of Poppies: Stories of Love and the Great War! Read an excerpt of my contribution, After You’ve Gone, on my website!